Bhakti Mathur is the author of the extremely popular Amma, Tell Me series on Indian festivals and mythology. Written in poetry format that’s a conversation between Amma (mother) and her kids, the books are extremely appealing. Amma, take me to Golden Temple begins with Amma taking her kids to visit the Golden Temple early in the morning and has to cajole the kids into walking a little bit more to meet the 400-year old Guru, a very effective hook for kids to stay glued to the book. Going further, the author describes the architecture of the Golden Temple and starts the tour by telling them about the Akal Takht, the Timeless Throne. The kids then see the holy book, Guru Granth Sahib, being carried in a golden palanquin and are confused as to why it is called the Guru. At this point, Amma tells them that there is a wonderful story about how this book came to be called as Guru. As they progress with the tour of the Golden Temple, Amma begins with the birth of Guru Nanak, the first Guru. Guru Nanak’s childhood, his teenage years and his experiences as he traveled across India are described in the book. Amma takes us through the journey of Guru Nanak and the transformation in him and the people around him as he taught about God in the form of simple poems and hymns connect beautifully with the kids. The story of how he spotted the perfect location for the now magnificent Golden Temple in the city of Amritsar is particularly intriguing, while his project of building the Harmandir Sahib (The Golden Temple) was taken to completion by the fifth Guru – Guru Arjan Dev. The book also describes the tradition of langar, started by Guru Nanak to provide free food for all irrespective of the caste or social status. Amma then tells them about the other Gurus and their contribution towards the religion and humanity. She tells them about the great Sikh king Ranjit Singh who generously donated gold for the temple. She describes how the Golden Temple had been attacked by Mughals and Afghans and how it led to the origin of the Khalsa community of Sikhs. Sikhism is one of the world’s youngest religions and this book beautifully describes its origin and growth. The book has a little map of the Golden Temple. It also has pictures and other details of all the ten Gurus. There is a historical timeline of the Temple and a few facts about the religion. 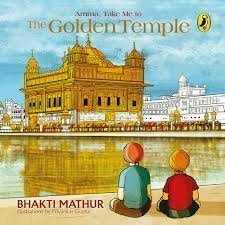 It is a very well researched book which will surely make the kids curious to visit and relive the stories about the Golden Temple. The author has also maintained a pinch of humor in the book through all the conversations of Amma with her children. Neha Modi is a Chartered Accountant-turned-Storyteller. An avid reader and a dedicated mother, she was associated with Thakur Institute of Management Studies and Research, Mumbai as a Finance Professor for 4 years. She is currently a visiting faculty at coaching institutes and teaches commercial applications to 9th & 10th standard students. Her mantra in life is – Grow through what you go through.